If past is prologue, the learning game industry is set for a wild ride in 2018. One of the most interesting trends and developments across the gaming industry is the surge in the popularity of both board and card games. From my personal observation and interactions with clients, the board game, card game trend is heading straight for the learning game industry as well. Meanwhile, the much larger but slower growing video game market only had an 18% growth rate according to the The NPD Group and Entertainment Software Association (ESA). Game shop owner, Kathleen Donahue, is quoted in The Washington Post article indicating that non-digital games provide a framework to interact with people in an easy manger, the rules have already been set up so people can be in a social situation and relate to others in a non-superficial level. This type of framework and sensibility is exactly what some learning and development organizations are looking for as they attempt to design learning activities that focus the learner’s attention and allow the leaners to interact with each other and the subject matter in an impactful manner. Many people think of card games as being simplistic or basic like the classic game “Go Fish” but it is possible to create sophisticated and elegant card games that encourage conversation and that even act as a type of “disguised” role-play. As an example, I know of several organizations and clients using a card game we’ve developed to teach and reinforce sales skills. The “generic” name of the card game is Zombie Sales Apocalypse™ but the name and nature of the game has been customized in several instances. 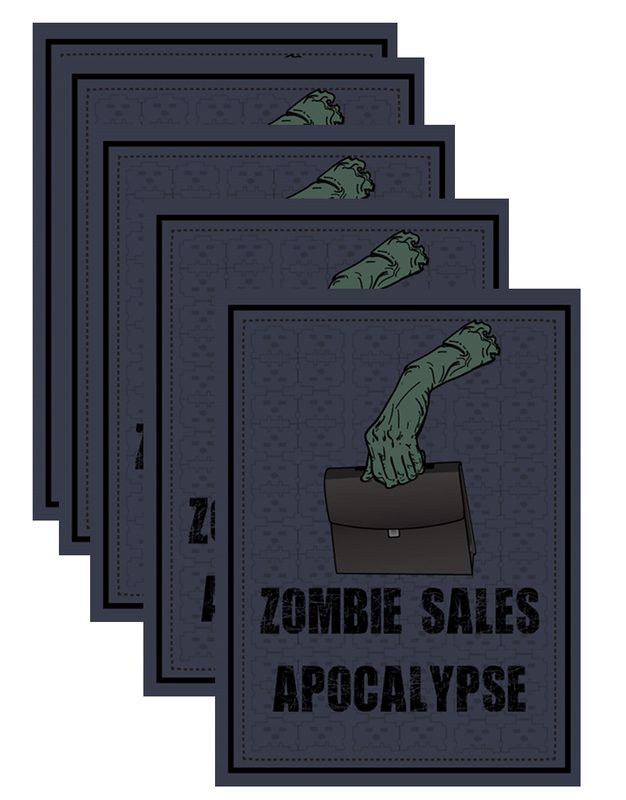 The Zombie Sales Apocalypse™ card game consists of challenge cards and scenarios cards and can be customized to meet the individuals needs of an organization. In the basic game framework, players alternate between presenting a response to a specific sales situation and challenging other player’s responses. One organization even created a “betting” mechanism where the players bet on the “correctness” of their response. 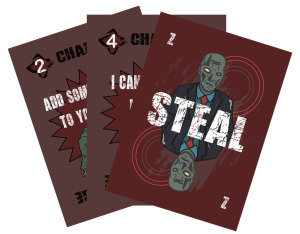 The card game is, in essence, an opportunity to practice the application of sales skills without having to evoke the “dreaded” role-play exercise. The outcomes and learning opportunities resulting from the game are similar, and in some cases better, than a pure role-play exercise. And, as a bonus, sales folks have been seen using the card deck in the hotel bar after the training has ended for the day (although, I can’t guarantee it was exactly played the same way after hours as during the official training hours—but I still think learning, rich connections and insightful answers were occurring). One organizational leader indicated she chose a card game over a digital game because cards games are better at encouraging robust conversations, making connections among players (employees) and creating a deeper understanding of the nuances involved with a sales interaction. The leaders of the organization felt the tangible nature of the card game, the social interactions of the game and the tactile nature of a card deck given to each sales person provided a powerful environment for learning, reinforcement and retention. From the development perspective, it’s much easier to customize a card game or board game than to customize a “generic” online learning game. It’s also easier to experiment with game dynamics and mechanics until the right combination is discovered through interaction and playtesting of card games. Card games also provide a tangible “take away” from a large event and, if designed properly, the games can be modified to be single player focused allowing the learners to keep practicing with cards even if no group of fellow players is available…but it’s almost always more fun with a group. We are not talking about the adaptation of the usual suspects like Monopoly or Trivial Pursuit. Rather the creation of board games for learning that leverage the sensibilities from off-beat and innovative games such as Settlers of Catan (now called simply Catan), Forbidden Island and Pandemic to name a few. Games that encourage critical thinking, prioritization of action and optimization of limited resources. Issues faced by managers, executives and all levels of employees on a daily basis. Issues isolating and alienating managers, supervisors and leaders. Carefully crafted board games can break through the isolation and let organizational leaders, managers and supervisors know they are not alone in these challenges while simultaneously teaching skills related to resource allocation, prioritization and critical thinking. Board games can provide insights into systems thinking that are hard to achieve through conventional instructional methodologies. Board games, like card games, have a social component and a leveling effect. When you play a game, everyone starts at the same level, no one has a distinct advantage and everyone can have an equal opportunity at success. Randomized board layouts. The “board” or gamespace is actually a series of tiles that are configured differently each time the game is played. This allows for variation every time the game is played. Multiple actions or activities per turn. A player can do several actions all in one turn such as trade cards with other player, trade in cards, move from one space to another, team up with another player or remove pieces from the board. This forces players to prioritize activities and carefully weigh the pros and cons of several possible actions. They now need to chose what are the best actions and in what order should those actions be undertaken. Cooperation rather than competition. The focus in on players working together to solve problems or dilemmas posed by the games instead of trying to crush or beat an opponent the idea is to get out of a bad situation like curing an epidemic in Pandemic or escaping an island in an escape room game like “Exit: The Secret Lab Game”. Creation as a theme. In a game like Ticket to Ride, the idea is to create a rail road empire. In a game like Catan, the goal is to build a community and in the game Agricola, the idea is to build up your farm. Equal participation until the end. In many of these game types, there is a turn limit or a time limit. The games provide opportunities for every play to be involved until the end. In a game like Monopoly, if your opponent has a bunch of hotel and you only own one Rail Road property, you are pretty much doomed. The goal of many of these games is to keep all players involved until the end. Integrated activities are required to be successful. As The Atlantic article so eloquently states a player “works to acquire A so they can invest in B, so that they can trade for C, so they can build a D, which in turn pumps out more A.” The games require players to perform in-game analysis of the consequences, trade-offs and critical paths relating one action to another. The games often models of complex systems which require the player to understand how the works and the trade-off inherent in the system. Much like actual work environments and economic systems of which many employee are an integral part. In a world where people are feeling more and more isolated and alienated due to being constantly connected to digital devices and show less and less empathy and connection to fellow humans, a board game or card game provides a connection. As you consider methods of creating engaging and meaningful learning experiences, seriously consider the use of board and card games. They are often less expensive to develop than digital games, offer a great deal of flexibility and are a wonderful tool for teaching higher level thinking skills, practicing sales pitches and bringing together different areas of the organization. Here are links to the games mentioned in the article. 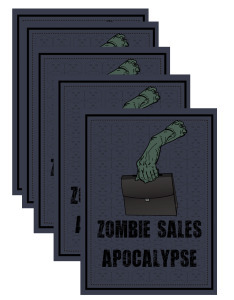 If you are interested in Zombie Sales Apocalypse: The Card Game, please contact me directly via contact on this page.